- Please never pull your ulfBo up over high curbs or stairs. The car floor can sit on the rough stone edge. The result is heavy abrasion or even holes in the fabric below the floorboards. Make sure you have sufficient ground clearance on uneven roads. Branches roots etc. can also lead to damage in the fabric. Such damages are not covered by warranty or guarantee. Parking Brake Maintenance: Dirt can cause immobility and breakage of the brake lever. If heavily soiled, the guideways on the back of the brake lever should be cleaned dry or with water. After drying, the guideways must be treated with silicone oil. Squeaky noises: If your ulfBo starts squeaking in use, plastic parts rubbing against each other are usually responsible. With silicone spray, the plastic parts are lubricious and thus eliminates squeaking noises. Silicone spray can also be ordered from us in the shop. Flat tyre: Your ulfBo is equipped with tubeless tyres. If a wheel of your ulfBo has been damaged by an object (shards, nails, thorns), you can use a flat tyre spray to repair the damage. We also offer a puncture spray that we have tested in our shop. If repair is not possible, you can order a spare wheel. 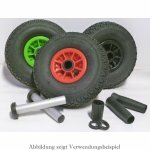 Thanks to the thru axles on your ulfBo, the wheels can be easily exchanged. 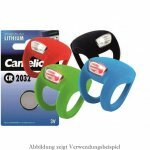 Spare parts: The most important spare parts can be found in our web shop under 'accessories & spare parts'. If you need more spare parts, please contact us. We like to help you. Care: The trextiles can be cleaned manually using a soft sponge with lukewarm water (about 30 ° C) and commercially available mild detergents. After a thorough rinsing, the material must dry. 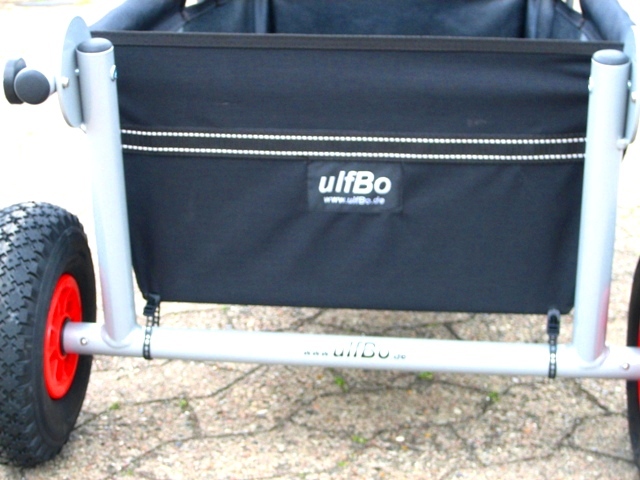 By mounting the convertible top on the ulfBo, the frame of the canopy is under tension, so that later the canopy tarpaulin is as taut as possible. When assembling, please tighten the star grip screws and nuts as firmly as possible. The opening of the plastic pipe clamp should point straight up. Especially in shops, be careful not to get stuck with the wheels on shelves or checkout zones. The "hubcaps" - the end pieces of the small stub axles can fall off. New "hubcaps" you can order by mail. Complete thru axles can be found in the shop under spare parts. The small ram pockets (about 27 x 20cm folded) have adjustable straps under the flap. With these straps, the small ram pockets can be attached to the tubes of the ulfBo. To buckle up children, we recommend harness systems, such as those available in specialist shops for baby carriages, etc. The adjustable belt systems can usually be attached to the pipes of the ulfBo. The handles of the convertible top last longer if you move them a little to the outside as in the photo after hooking, so that the handles are not under tension. Please do not overtighten the screw connections on the drawbar. The joints must remain easily movable. Can the textile body of the ulfBo be removed for washing in the washing machine? - The textile body can be removed after loosening the screws and the locking pins on the two front and rear joints. Nevertheless, we can not recommend washing the fabric in the washing machine because it will wash off the dirt-repellent coating completely. It is better to perform the cleaning of the fabric manually using a soft sponge with lukewarm water (about 30 ° C) and commercially available mild detergents. After a thorough rinse with clear water, the material must dry well. Can the textile body be replaced later if it is old, dirty or damaged? - if necessary, the entire textile body of a ulfBo can be changed. The costs are available on request. Is the drawbar long enough for tall people? 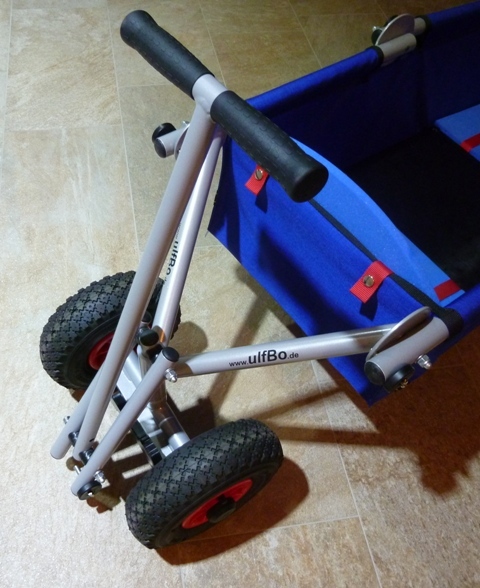 - the regular drawbar on a ulfBo handcart is long enough for most people. 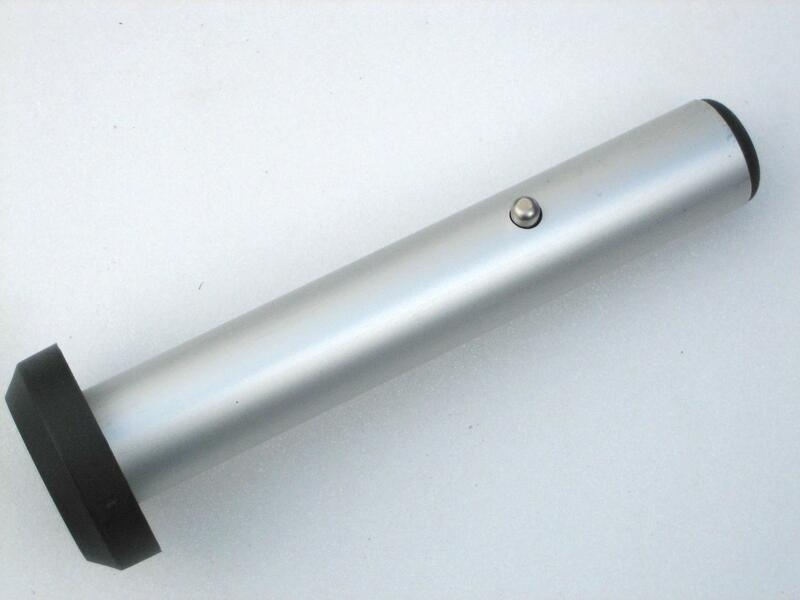 For very tall people, we can offer 10 or 20cm extended drawbars. Please note that this changes the pack size of the ulfBo. The 10cm extension is recommended for people from about 1.95m (surcharge 15, - Euro), the 20cm extension for persons from 2.05m (surcharge 25, - Euro) body size. With a mounted set of skids, the distance between the drawbar and the start of the wheel / runner decreases by approx. 15 cm. Upholstery set for ulfBo "standard"? The ulfBo "standard" can be supplemented with the upholstery set of our ulfBo "comfort". The upholstery set is available in our shop. Is a ulfBo treated by the flight crew like a stroller? Can we deliver the ulfBo to the flight crew like a stroller? - In most cases yes. To be on the safe side, please ask your airline for the exact handling. 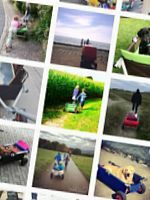 Also ask if a stroller (= ulfBo if used to transport children) is transported free of charge. Is there a transport bag for transporting the ulfBo on air travel? 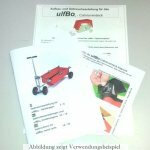 - Under accessories / spare parts you will find a padded transport bag specially made for the ulfBo so that you can travel with the ulfBo. 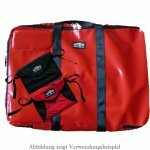 The flight bag has the dimensions of about 73x58x26 cm and is designed so that the folded ulfBo including the folded convertible top fits into the bag. The bag weighs about 2.6 kg. A ulfBo with the 10cm drawbar extension also fits in the flight bag. 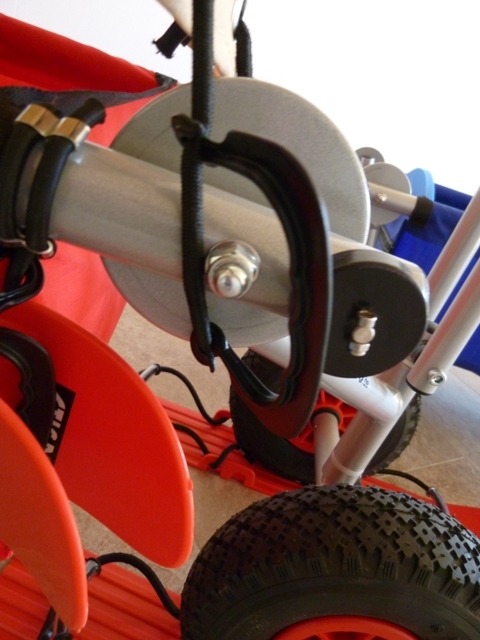 With the 20cm drawbar extension, the drawbar must be detached from the cart with 1 screw and stowed individually in the bag.